This is your average drugstore combo of “lather-rinse-follow-with…” that you’ve probably used for years. In general, depending on how oily your scalp is naturally and how sweaty you’re getting from your workouts, you should be washing your hair with these products 2-3 times per week. Some folks will need to shampoo more of less often, but if you have very dry or color-treated hair, keep in mind that more frequent shampooing will strip your hair much faster. With that said, generally, you should shampoo after a heavy sweat session, and no less than twice a week. You don’t want your hair to look and feel dirty, and you definitely don’t want to smell like a gym! You don’t necessarily need to use a matching “set” of shampoo and conditioner, but some are engineered to work better when used together (such as a color-boosting formula). You can also try different formulas depending on your needs, to help protect color, add extra moisture, or boost volume. 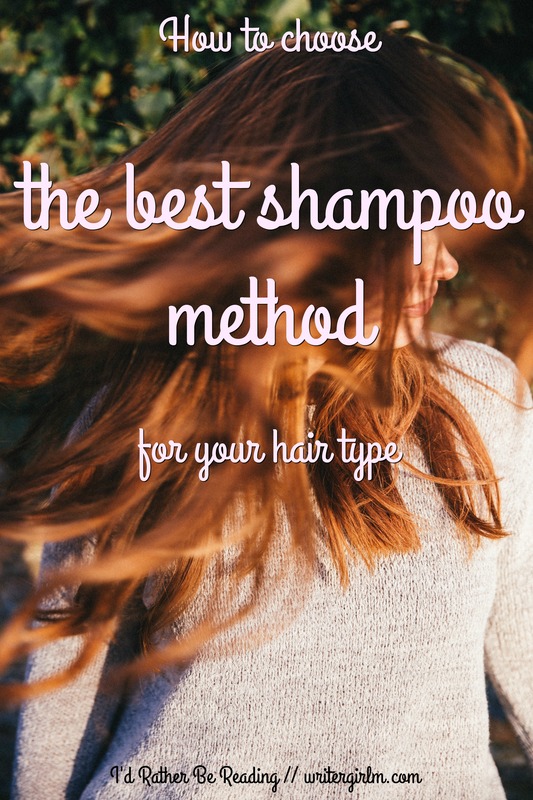 Remember, even with a “basic” shampoo/conditioner combo, the best shampoo method for your hair is based on your personal needs, so grab a bunch of those travel-size bottles and experiment. And read lots of reviews online! If regular shampoo is too harsh for your hair, cleansing conditioner (see type #4) is a good alternative. If you use lots of products, a clarifying shampoo is great for using a few times a month to really get your scalp clean. Deep conditioners are amazing for use once or twice a week to add moisture from mid-shaft to ends. You’ll also see different types of deep or leave-in conditioners that are meant to be left on overnight, or can be used everyday on damp or dry hair as part of your styling routine. Color-intensifying shampoos and conditioners are awesome if you color your hair and worry about fade—they often have matching glazes for even better results.You can also find keratin shampoos for temporarily straightening and smoothing hair, and special shampoo/conditioner systems that are used in reverse (conditioner, then shampoo) to avoid weighing down fine hair. 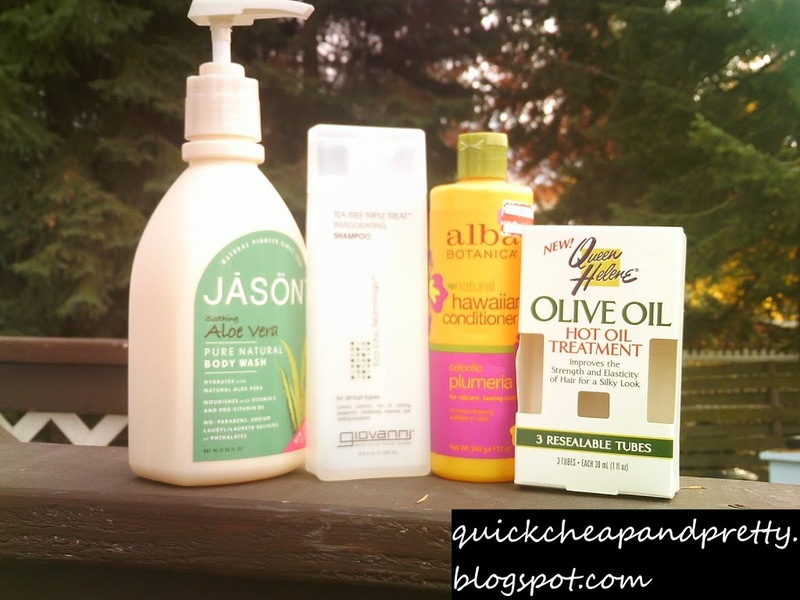 These products aren’t for all hair types and aren’t necessarily meant to be used every day. Once again—I simply can’t say it enough—the best shampoo method for your hair is not necessarily the same for your best friend or your favorite blogger. If you don’t feel like you’re experiencing product buildup, don’t let someone talk you into buying a clarifying system just because it’s what works for them—make sure it’s what you actually need and want. Otherwise, you’ll end up with a shower full of pricey, unused products. Take a peek at a site like MakeupAlley to get reviews on the products specific to your needs—you’ll be surprised at all the varieties on the market! Available in aerosol and powder forms, these products soak up oil from the roots, add body and texture, and keep your hair smelling good, all without water. They come in regular and tinted formulas. While they’re great for refreshing hair in between regular washes, they’re not the best shampoo method for, say, a super-sweaty SoulCycle session. And since they tend to build up on the scalp, you won’t want to use them for more than a few days straight. You also won’t get that squeaky-clean feeling of a fresh water-and-suds shampoo, so some folks prefer to use a cleansing conditioner (see type #4) on their “no-poo” days instead. I touch on this very briefly in yesterday’s Birchbox post. Cleansing conditioner is big with folks who need extra moisture or just feel regular shampoo is too harsh for their hair type, such as girls with ethnic hair or those with very fragile dye jobs. If you don’t have those concerns and love washing your hair daily but don’t want to overstrip your strands, you could use this a few times a week on your “in between” days instead of dry shampoo and still use your regular shampoo/conditioner combo on the other days. Folks who use lots of styling products or have very oily scalps may not feel that they get as clean with a CC as with a traditional shampoo. On the flip side, folks who need more moisture might still need to follow up their CC with a second conditioner. Again, it’s all a matter of personal preference and haircare habits, so customize your routine accordingly! I will totally admit to being high-maintenance in the hair department. Hell, I’m picky about my products! I want my hair to look and feel clean, soft, and shiny. And of course, it needs to smell good! I think I speak for a lot of women when I say that when my hair looks great, I feel great, too. Dirty or dry, faded hair just makes me feel crummy. Figuring out my personal best shampoo method has involved lots of trial and error and lots of product testing. My hair is long, fine, somewhat dry, and color-treated, so it needs to be babied a little—a full wash every day would leave it overstripped and unhappy. At the same time, I work out several times a week, with 2-3 of those workouts being very sweaty HIIT or running sessions, so on those days I simply must do a full shampoo/conditioner routine. I just can’t get super-dirty during a workout and then not deep-clean my hair! Yuck! I can’t fathom doing a HIIT workout and then just spritzing on some dry shampoo. 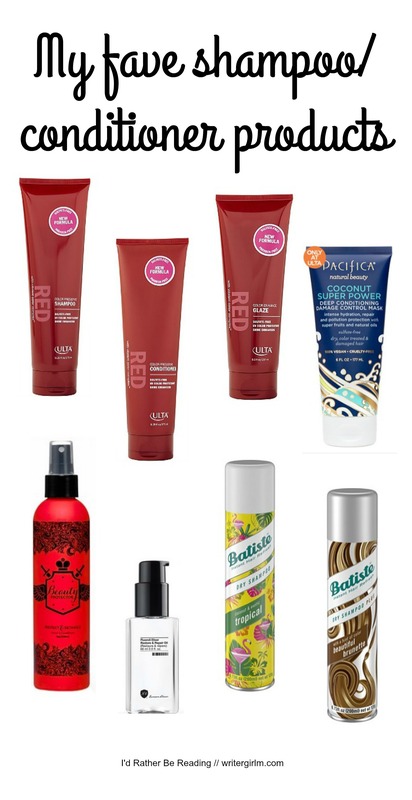 On these regular shampoo days, I use the ULTA Red Color Preserve shampoo and conditioner ($5.99 each; ULTA stores or online). Because red hair is so quick to fade I also use the matching glaze ($9.99) for extra protection. I use these products up to three times a week. This seems to be the magic number for my hair—it’s often enough to keep my hair clean and fresh, but it’s not so often that my haircolor fades. For extra moisture, I use a deep conditioner from the ears down—I’m currently loving the Pacifica Coconut Damage Mask ($16, ULTA stores or online). It leaves my hair soooooo silky—I stock up whenever ULTA has a sale! After I’ve towel-dried my hair, I use two more conditioning products to protect against breakage and add softness and shine. A few drops of Fluoro5 Elixer from Number 4 Hair Care ($26, online) gives my ends one more conditioning boost, while several spritzes all over of Beauty Protector Protect & Detangle ($23.50, through Birchbox) smooths out my knots and leaves my hair soft, shiny, and smooth, but not weighed down. (It also adds heat and color protection!) These products are pricey but require such small amounts each time that they’ll literally last me all year. And after using them, I don’t even need other styling products (unless of course I’m doing something specific that requires texture spray or hairspray). Some leave-in products turn your hair greasy more quickly, but these don’t, so I don’t feel like I need to shampoo again the next day. For the in-between days, when I’m not getting super-sweaty and just need a light refresh, I use dry shampoo on my roots and add a little more leave-in conditioner to my ends. 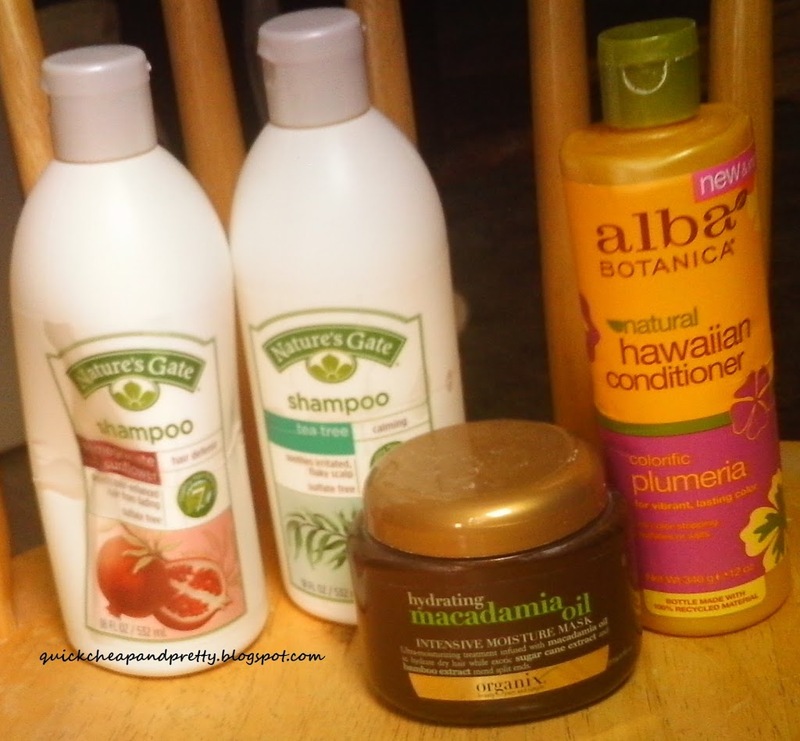 This keeps my hair fresh and pretty without needlessly stripping away moisture. I rely on Batiste dry shampoo ($7.99 to $8.99 at drugstores or online) and actually use two different versions of this product at the same time. I’ll spray the Tropical Batiste at the back of my head and underneath the bottom layers—I love the scent of this product! For the top and front sections, though, I use the Hint of Color version (Beautiful Brunette). It doesn’t have the same great fragrance but it leaves less of a chalky “cast” on my darker hair. (If you have dark hair, you know the struggle!) Finally, if my ends are looking thirsty (and they often are), I use a few drops of the Number 4 Elixer to revive them. It’s great to finally figure out what works! It took me so long! But now I’m religious about my routine! I like color-intensifying shampoo + conditioner. My favourite product is Matrix Total Results Color Obsessed Shampoo. I haven’t tried that one! Thanks for the recommendation!